9th great grandson of Jeffrey Ferris. Youngest of four children of Alice Josephine Cheney and Walter Lewis Ferris. Naive of New Haven, Connecticut. 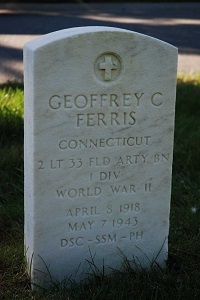 Ferris is buried in the Long Island National Cemetery in Farmingdale, New York. His awards include the Distinguished Service Cross, the Silver Star and the Purple Heart. The DSC is the second highest award for valor in the U.S. Army, ranking below the Medal of Honor. The President of the United States of America, authorized by Act of Congress, July 9, 1918, takes pride in presenting the Distinguished Service Cross (Posthumously) to Second Lieutenant (Field Artillery) Geoffrey C. Ferris (ASN: 0-420345), United States Army, for extraordinary heroism in connection with military operations against an armed enemy while serving with the 6th Battalion, 33d Field Artillery Regiment, 1st Infantry Division, in action against enemy forces on 6 May 1943, near Beja, Tunisia. On the morning of 6 May 1943, the 33d Artillery Regiment was given the mission of taking Hill 139 in the vicinity of Beja, Tunisia. Because of the heavy machine gun and mortar fire covering all approaches, it was necessary to attack before daylight. Second Lieutenant Ferris, as artillery forward observer with the assault elements, crawled forward across open terrain swept by withering enemy machine gun fire to a point well beyond our lines. Realizing the danger of his mission, he had ordered his men to remain behind while he advanced with a wire reel and telephone until he was killed. The unselfish heroism and the courage and zeal with which Second Lieutenant Ferris performed this deed exemplify the highest traditions of the military forces of the United States and reflect great credit upon himself, the 1st Infantry Division, and the United States Army. The Ferris Barracks at Erlangen, Germany was closed shortly after the end of the Cold War, June 28, 1994.